The KIPP Renaissance High School Pennant Ceremony honors alumni who have completed their first year of college! It’s one thing to be told about your future. It’s another to see it presented before you. 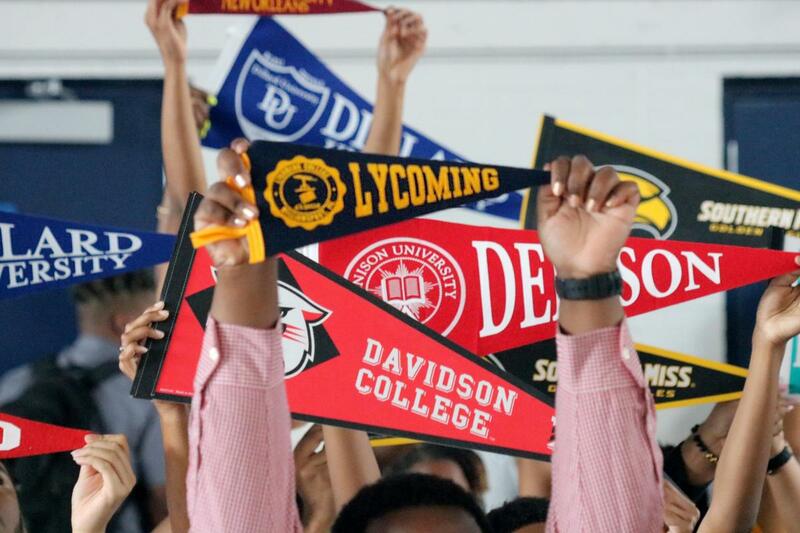 KIPP Renaissance High School (KRHS) students had the opportunity to experience their possible future last week at the annual Pennant Ceremony. The impact of those words spoken by KRHS College Counselor Dan McGrath resonated among the more than 500 KRHS scholars who packed the gym in anticipation. The chairs McGrath spoke of held center stage on the floor. Seated in those chairs were 25 members of the KRHS Class of 2017 who had completed their first year of college. Cheers greeted each alumni as they received a pennant from their school of matriculation in front of the KRHS student body. In all, 60 students of the Class of 2017 are continuing on to their second year of higher education this fall. The purpose of this ceremony is two-fold: to recognize the major accomplishment of KRHS alumni in completing their first year of college and for the current KRHS students to see that the goal they are working toward — to and through college — can be the same reality for them that it is for the alumni. In its fourth year, the ceremony strengthens the idea for both current and previous KRHS students that KRHS students are college-bound and will be college graduates. “We also hope that this helps our KRHS seniors feel the urgency to make their college decisions now, so they can spend the bulk of senior year securing money, making it possible for them to go to their dream school,” Cornelius said. And then one day in fall 2020, those seniors will be back at KRHS, sitting in those same chairs, waiting to receive their pennant in front of the newest group of scholars.